Americans wanting that flashy Zelda edition 3DS XL may not have to import a European model. If GottaDeal.com’s leaked copy of GameStop’s Black Friday flyer proves to be accurate, Nintendo’s gold-colored handheld should be available in the US for $220. 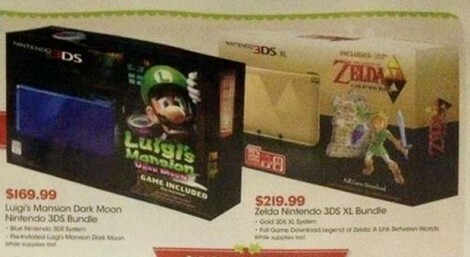 As overseas, stateside buyers would get both a Triforce-adorned 3DS XL and a download code for A Link Between Worlds. Nintendo hasn’t confirmed an American launch, so don’t plan your shopping trip just yet; we’ve reached out to the company for details. Should the Zelda bundle come to the US, though, it may satisfy gamers (and gift-givers) looking for a truly stand-out system this holiday.